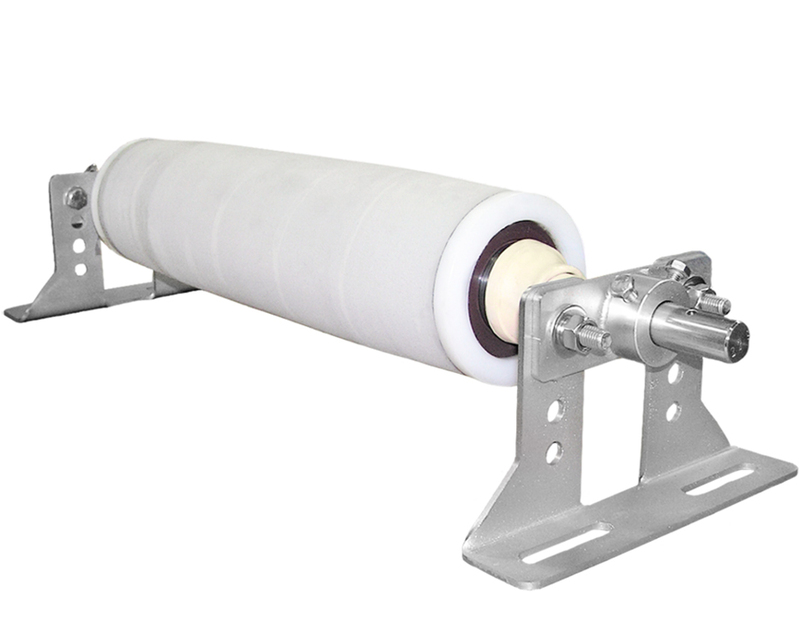 Manufactured Products Belt Cleaners, Conveyor Idlers, Wear Liners & more. Bulk Material Handling / Distribution Division Belting, Pulleys, Idlers & more. ACT™ Conveyor Training School High quality team training that works. ASGCO®’s Food Grade Tru-Trainer® training idler is designed and proven for training lightweight conveyor belting in the food and material handling industries. Internal pivot provides fast reaction – to track the conveyor belt to the center of the system. The Tru-Trainer® idler has a patented internal pivot that is perpendicular to the plane of the belt. Since the surface of the belt remains in contact with the roller over the entire width of the belt, the training action is far more effective then the conventional style of training idlers. As the belt starts to move off-center it will contact the tapered section of the roller on that side of the belt. The effect of this will be to force the roller to pivot on its central pivot causing the belt to come to its original position. Once the roller has steered the conveyor belt back to the center, the opposite side of the belt will contact the taper on the opposite ends of the idler and this will cause the idler to realign itself perpendicular to the belt. Food Grade Tru-Trainer belt tracker in application (shown at cereal plant). Greg Haupt, Safety Auditor, Paradise Point, Marine Inc. Need Solutions To Improve Efficiency, Safety & Productivity?